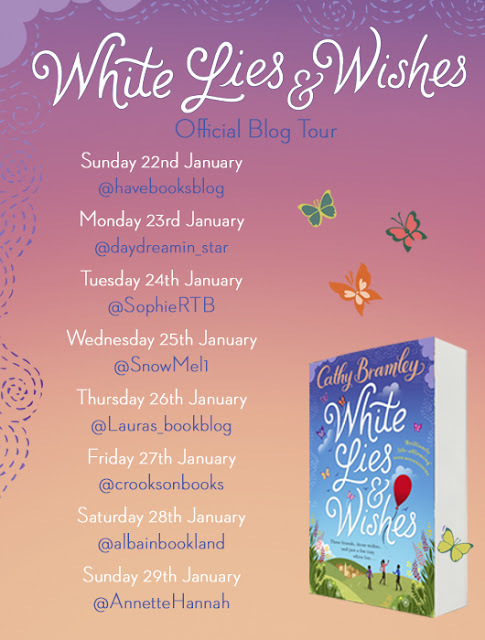 Today on Laura's little book blog, I am delighted to host my stop on the White Lies and Wishes blog tour. On my stop today, I get to share my review of this delightful read. I do so love Cathy Bramley's books, they just seem to envelope you in a warm hug and give you the escapism you need. The first few pages, despite the funeral setting, actually had me in hysterics. You will know what I mean when you read it. It was safe to say that Sarah made herself one my favourite characters very quickly. Jo, Carrie and Sarah were actually great characters in their own right. Each so distinct from the other and as a reader, you feel that you really get to know them. I liked seeing how their friendship grew despite the misunderstandings along the way and how they were there for each other in times of need. There were times that I wanted to shake them and tell them to stop being silly, but that was only because I wanted to see what was right in front of them. I think what I liked about this as a lot of this was that the situations of each of the characters was really relatable. So I haven't got a baby or own my own company, or trying to get a bikini bod (although that would be nice!) like Sarah, Jo and Carrie, but each of them are ignoring what it is that would really make them happy compared to what they feel they should be achieving. I just found it really enlightening and it got me thinking about what would really make me happy. It's also quite life affirming to realise that not everyone's life is perfect and we all have things to deal with. Safe to say, this was another great read from Cathy that took me away from the stresses and strains of the real world.